McDonald’s workers have filed 28 complaints to OSHA about workplace safety, alleging that staff shortages and pressure to work faster have resulted in burns, which their managers often told them to treat with condiments. Lack of protective equipment, empty first-aid kits and horrific grease burns are just some of the complaints from the McDonald’s workers in 19 US cities, made public Monday by the labor campaign “Fight for 15,” led by the Service Employees International Union. The US Occupational Safety and Health Administration (OSHA) has already investigated six claims, with more inspections pending. Backing up the labor activists is a survey by the National Council for Occupational Safety and Health (COSH), showing alarming rates of workplace injuries among fast-food workers. Worse yet, the survey shows lackluster management response. “One-third (33%) of all burn victims say that their manager suggested wholly inappropriate treatments for burns, including condiments such as mustard, mayonnaise, butter, or ketchup, instead of burn cream,” says a memo from the DC-based Hart Research Associates, who polled over 1400 fast-food workers across the country on behalf of COSH. The poll showed that 87 percent of the workers reported workplace injuries, and 79 percent say they were burned on the job. Some 58 percent reported multiple burns. Given that the fast-food industry employs 3.6 million workers, that would amount to 2 million people, says COSH executive director Mary Vogel. “We have to do a lot better than offering workers a packet of mayonnaise after they get burned,” Vogel said. 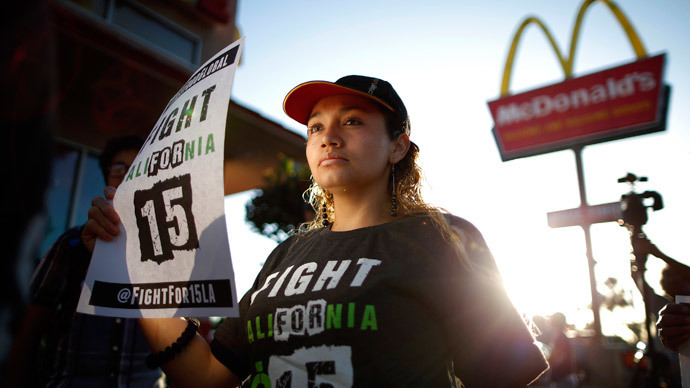 Kendall Fells, organizing director for “Fight for 15”, told the AP the workers’ injuries were caused by the lack of protective gear and training, but also due to a computer system used by McDonald’s to track sales and staffing metrics. As a result, there are fewer workers, and they have to work faster, causing accidents and injuries, Fells explained. So far, OSHA agents have inspected six of the restaurants named in the complaints, Bloomberg Business reported. The agency has six months to complete the investigations and issue citations. A “serious” violation carries a maximum fine of $7,000. “It is important to note that these complaints are part of a larger strategy orchestrated by activists targeting our brand and designed to generate media coverage,” McDonald’s spokeswoman Heidi Barker Sa Shekhem said in a statement. Labor activists admit they are out to pressure McDonald’s into allowing employees to unionize, raise the wage to $15 an hour, and improve working conditions. The campaign started over two years ago, with several strikes and protests taking place around the US.